Fully-assembled in a glass apothecary jar, this tiny landscape is populated by a petite pair of lovebirds. From the miniature world virtuosos Michelle Inciarrano & Katy Maslow comes this simply adorable moss-filled microcosm populated by a small couple of your choice. 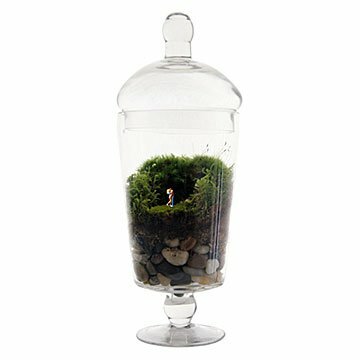 A thoughtful anniversary or vow-renewal gift for green thumbed lovebirds, the "Grow Old With You" terrarium comes completed with glass apothecary jar, moss, figurines, rocks, and soil. For a life that's enduring as the love shared by the terrarium's tiny inhabitants, keep the vessel out of direct sunlight and mist every two to four weeks. Created in Brooklyn, New York. Jar made in China. Moss terrariums need to be kept out of direct sun. Mist every 2-4 weeks. The terrarium is absolutely adorable. Makes me smile every time I look at it. This was purchased as what was supposed to be a meaningful gift. Instead it arrived looking like a do-it-yourself craft kit for a child. For the price that was charged, the value received was more like a cheap project from a craft supply store. Bought for my parents the "growing old with you" - saw this last year, but couldn't order in tie for Christmas delivery, so excited this year to order early. Very pricey product which came in a plastic looking container, average moss setting but mostly disappointed with how TINY the figurine (bench with couple) was. If this was 25.00 would not coplain, but very disappointed for price. How disappointing. The gift that I bought as a meaningful memento for a senior couple looked like the components came from a craft store for a fraction of the price I paid. I should have known better than to buy a non-refundable item. For that reason, I didn't contact the vendor. I feel like the victim of a con job. Item was purchased for a wedding gift, arrived promptly after ordering, but was incomplete. Missing PARK BENCH couple is supposed to be sitting on. Several inquiries, yet weeks later still no bench. Wedding has passed, gift still waiting to be delivered awaiting missing BENCH. I gave this as a wedding gift because I thought it was so unique. I got a text from the recipients saying 'Love the creativity in this gift, wonderful!'. I knew this would be well received and am so happy I decided to splurge a little more than usual on a wedding gift. Highly recommend! Arrived just as pictured and described and earlier than predicted. Very well packaged. This was for a coworker who was retiring after 42 years and he and his wife enjoyed gardening. We had the back of the vase engraved as well as the lid around the top with congratulatory type statements. It was a very attractive and unique gift. It did seem small to me although I had noted the dimensions; the detail is quite charming overall. the glass on both the lid and the container were chipped. other than that we thought it was great. Beautiful product. A tiny bit concerned about the health of the moss - seems to have taken a licking in the shipping - but overall a unique and lovely gift.